It's nice. Fits in my washer and comes clean easily. Add a refreshing pop of color to your bedroom with the Laura Ashley 3-piece Bedford Blue Reversible Quilt Set. This set features a soft cotton construction with a reversible design and a floral pattern in blue and white. This is a darker blue floral than it looks, the reverse side is or about the same color as pictured. I was looking for something in the colors of blue willow china, navy blue and white but in a French toile floral print. This fit the bill perfectly, the colors; the print; light weight, can be used year round just place a thermal or fleece blanket underneath. Good length on the drop. Lots of room in the shams for queen size pillows. Paired this set with navy plaid flannel sheets and a white eyelet lace bed skirt and a navy blue velvet headboard. Found drapes to match at jc Penney's. The color is a tad darker than in the picture--more a delft blue--which was actually a good thing, as far as I'm concerned. Quality is good. Two twins and they've been washed a couple of times, no fading, comes out of the dryer like new. My only complaint is that they're skimpy. The picture shows it going to the floor. It doesn't come anywhere near the floor. On our twin beds, the quilts hang over the sides about six inches--not even long enough to reach the top of a bed skirt, which means the box spring shows. We got tired of the look and have ordered full-queens for the twin beds. 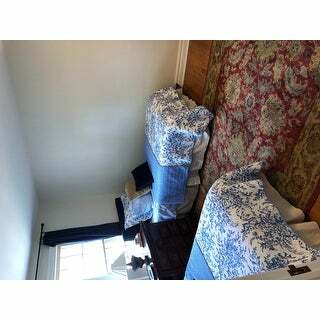 I expect them to be too wide, but we like the quilts otherwise and the price is good. The twin size will go to the Salvation Army. Lovely coverlet. Although I was looking for a bedspread I couldn't find one that I liked and settled on this. I hope it doesn't shrink as I like it a bit longer on the sides. I have a king bed so couldn't get anything larger; However, if I had a smaller bed, I think I'd order the size up -- especially if you want it to look like the picture and hang closer to the floor. The king just reaches to the box spring (and I don't have super deep mattresses either). The colors match the image on my monitor. This quilt and sham set is just as beautiful as it looks in the pictures. The blue is the classic blue one sees in toiles--it has no purple tinge as seen in the picture. I have use the queen quilt on an 11" viscoelastic mattress and it covers beautifully, overlapping the bed skirt on both sides by 3 or 4 inches. Only down side is I can't find matching drapes. Add a few layers of linens like throw pillows, a nice blanket, and nice sheets, and this set looks very luxurious! I worked with this set to mimic what I've seen in hotels. That is, white sheets, a white down (or in my case down alternative) comforter, the included shams, plus 2 pillows per person, and finally a throw pillow. I used the quilt itself rolled back at the foot of the bed to mimic the look that hotels have of putting a patterned blanket or similar at the foot of the bed (I presume so that when people hop into the bed with their shoes on or feet up, it protects the rest of the bedding. Not sure, but that's what I do!) Because the quilt is reversible, You can roll is back and show both sides and get an even more custom and lively look, especially for me when I'm using white linens for everything else. I will add that at least on my monitor, I thought other than the blue, the pattern would be a soft yellow, off white, or beige. It's more of a pure white to me in real life, but everyone's eye are different! I don't think you'll be disappointed! UPDATE: I had to wash this bedspread. Followed the guidelines. Dried on a "comforter" setting. It has shrunk SO much I can't use it on the bed any longer. Because the shrinkage so so much I've changed the rating from 5 stars to 3 stars. I'm quite disappointed. I loved how pretty this was. ------------------------------------------------------ I purchased the king size. If your bed can be seen from all sides when entering the room, you will definitely need a bed skirt. However if you can make one side shorter so to display a longer side that is seen all the time, you can get by without one. I purchased four white pillows &amp; 2 dark blue ones as well as two white w/blue design. You do not NEED these -- it comes with two shams. I have not used the reverse side other than to fold back the quilt at the top. The background is white - not cream or ivory. There are various colors of blue within the floral top so it is easy to match or use various hues of blue in your bedroom. The quilt has been in use for about 4 months. I have not laundered the quilt or the shams. I do recommend this set. This Laura Ashley quilt is bright, cherry, comfortable weight and I was more than pleased! Very pretty and a great price point. Note: The blue is a little bit richer than the photo, and has some more navy, but it is still a lovely set. Great value. I love Laura Ashley products and this quilt set is a beautiful set and I love the color of the blue in the quilt. The quilt washes well and holds up great and is one of my favorite quilts. The quilt is not a large quilt and I have a queen size mattress and I think if I were to buy it again I would get a king size so it would hang down further over the sides of the mattress. My mattress is just a select comfort mattress also so it isn't even that thick. That is my only complaint with the quilt, but other than that, I love the set and will eventually buy the king size for my bed. Bought this for a king bed that I moved into our guest bedroom. It is a beautiful design and the quality is excellent. Very pleased with this purchase! It is so pretty the color, but I was thinking there's a yellowish background but it is all white but otherwise it is good. Love love love my new spread! Looks cheeky with my blue and white check chair. Using it as an English LOOK cover for my loveseat. Great quality. My company thought it was a cute addition to my cottage. I got this for my mother in law's 2015 Christmas gift. She uses it during the spring and it is pretty but I was expecting softer blues. There's actually some navy in it. Very beautiful even more so in person. GREAT price and so worth it. Nice quality. If you love these colors then you will love this quilt set. 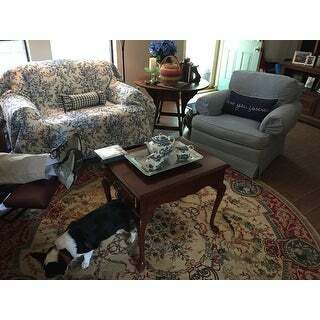 Laura Ashley quality with Overstock low prices and low cost or no cost shipping - what's not to love. This is a gorgeous set! The colors are beautiful and it’s a good size for our king bed. I can’t wait to find curtains to match! Even my husband really likes the pattern and colors. This is on my bed right now. Its beautiful and durable. I have 4 kids that are always jumping on my bed. This is easy to wash and dry. A must! "What are measurements of King size spread"
"Can I order standard shans and a dust ruffle to match?" Unfortunately, we do not currently stock shams or dust ruffles of this set. "it says blue and white but it looks more like off white in the photo?" It is an off-white (ivory tone). It is more white than it looks but it is a soft white. Absolutely beautiful. "Is this blue a periwinkle blue, maybe could tell me what color of blue?" I'd say it is more of a dresden blue. And it does not have turquoise tones in it. You'll need a bedskirt with it. I was not that impressed with it, looks a ittle on the cheap side. Good luck. It isn't periwinkle blue but it does lean that way, at least in the light of my home. It's a very pretty blue that you don't see a lot now, my husband even commented on the color! This blue goes perfectly with my navy accents. To me, periwinkle has purple hues, this does not. Unlike the person before me, I think this is a fabulous value and I quite impressed. "how is this fitting on a king bed....i dont know they cant make actual king size that covers top and both sizes"
I bought it for a queen bed and it still doesn't cover all the way to the floor on 3 sides. One direction it covers from side to side but not top to bottom, the other direction it is ok top to bottom but not side to side. I don't know why they don't make them to fit without a bedskirt, which I hate dealing with!! You will need a bedskirt with it. Also, it is not cornflower blue as in the photo, it is more of a royal blue and white. Looks prettier in the photo than in real life. "Is this quilt ,Laura Ashley Bedford, blue and white? Why does it mention blue , white, rose, and red? I want to order this in King but worry that it has these other colors! I order another quilt last week and it had other colors in it." This quilt does not have red or rose color in it. "I have a queen bed. If I purchase the Full/queen size will I need a bed skirt. This is something I don't want to mess with. Is thi more like a bedspread than a quilt? A bedspread is what I would rather have"
Hi, I'm sorry I can't help you. I bought the set as a gift. I have a queen bed. The quilt covers my mattress from both sides. My mattress is about 11 inches thick. It does not cover my box spring. I'm not sure what kind of bed you have so you may need a bed skirt. It is a little more than a quilt but doesn't fall all the way down. I never use a bedskirt as I have a very nice wooden frame that I like to show.